About 4-5 days back, I came to know about this awesome project Indie Game : The Movie, a documentary movie about indie games and life of developers. The project had reached $12,000 goal out of $35,000 fund raising target, so I thought I would write about it. But, then I was not able to finish it on time due to office work. Today, I checked Kickstarter funding page for the movie again and was surprised to see that It has already crossed $35,000 mark after a final push made by the film makers. There are as many as 883 backers for the project and has received lots of love from people all around the world. 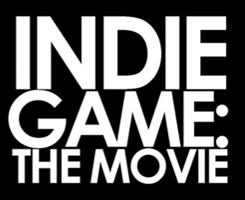 Indie Game: The Movie is a feature documentary about video games, their creators and the craft. The film follows the dramatic journeys of indie game developers as they create their games, and as they release those works, and themselves, to the world. The Movie is about making video games, but at its core, it’s about the creative process and how developers bring out their hidden talent and capabilities through their work. The film tells the emotional story of a two-man team, Edmund McMillen and Tommy Refenes, as they craft and release their first major game for XBOX, "Super Meat Boy". It follows Phil Fish, the creator of the highly- anticipated game, "Fez", as he shows it for the first time in 4 years at the giant gaming expo, PAX EAST. And, the film tells behind-the-scenes story of an independent designer, Jonathan Blow, who made one of highest-rated video games of all-time, "Braid". Four developers, three games, and one ultimate goal - to express one’s self through a video game. The film’s budget has been a combination of crowd-funding, DVD pre-orders, personal investment, and winnings from Westdoc, a Los Angeles documentary film pitch competition in which the film makers took part in. In less than 25 hours, we were able to reach our Kickstarter goal. The campaign currently stands at $36,493 from a very generous, big-hearted collection of 781 people. Filming has been done mostly and a very solid rough cut is available. Th target is to have IGTM complete in mid-August. The movie will feature many Linux games developers and their story. Developers making appearances are Jonathan Blow (Braid/The Witness), Ron Carmel (World of Goo), David Hellman (Braid), Kyle Pulver (Snapshot), Jason Rohrer (Passage/Sleep is Death). You can pledge for the project for pre-orders and many other benefits at the KickStarter Page. Money raised beyond the goal mark will allow the film makers to add to the production value and audience experience even further.